From A1 Exit FIRENZE NORD: follow directions to Fortezza da Basso. From the Fortezza da basso: take Lavagnini avenue, at the first traffic-light turn right to via Santa Caterina, continue straight through via Nazionale till the end. At the traffic lights (you are in front of the train station, take left around the square and enter Piazza dell'unità italiana. Then take via del Melarancio (the street on the right side of the Hotel Baglioni. Drive until to the little piazza Madonna degli Aldobrandini, then take right to via dei Conti, at the crossroad on the left for via Zanetti, then to right to via Cerretani, at the first traffic-light turns on the left (to right have Laurus Hotel) for via Vecchietti, after the first road on the left, Via de Pecori until to the end, to right for Via Roma, the first to the left on via Tosinghi then turn left on via Calzaiuoli. The Hotel is further on the left. From A1 Exit FIRENZE South: A1 escape to Florence South, after the casello highway all straight until to the end of the road, then turns on the left, you take the lungarno, still straight until to the end, then to right for Amendola avenue, the traffic-light on the left for via Duca of the Abruzzi, then endured to right and then on the left, at the traffic-light, you across the avenue and take via dell'Agnolo, all straight until to the end, then right to via Verdi, and then after the traffic-light on the left to Via dell'Oriuolo. Go straight to the end of the street (you'll arrive at the back of the Duomo) and then turn left on via del Proconsolo, then the first on the right to via del Corso. Drive to the end of via del Corso then turn right on Calzaiuoli. The Hotel is further on the left. From Piazza Libertà/Piazzale Donatello: follow directions to Piazza Beccaria. 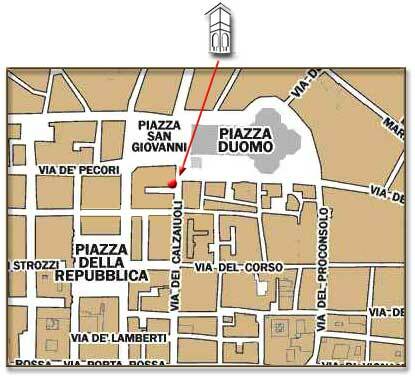 From Piazza Beccaria: drive south, after the crossing lights turn the first street to the right, via dell'Agnolo, then straight to the end; then right to via Verdi, and then after the traffic-light on the left to Via dell'Oriuolo. Go straight to the end of the street (you'll arrive at the back of the Duomo) and then turn left on via del Proconsolo, then the first on the right to via del Corso. Drive to the end of via del Corso then turn right on Calzaiuoli. The Hotel is at the end of the street to the left. From A1-Exit FIRENZE Certosa: follow signs to Porta Romana. Once at Porta Romana square enter via Romana through the ancient city walls and drive straight till the end of the street, then continue on via Maggio, cross bridge SS. Trinita and continue straight to via Tornabuoni, pass the traffic lights and after that turn at the second to the right, which is via degli Agli; continue straight to via de Pecori even if the sign says that you are entering the pedestrian area (with the hotel reservation people is temporary allowed to reach the hotel). At the end of the street turn right to via Roma , the first to the left on via Tosinghi then turn left on via Calzaiuoli. The Hotel is further on the left. From Lungarni: arrived to Goldoni square, turns to right, crossed the Bridge Carraia, endured after on the left you take the Lungarno Acciaiuoli until to the end, turns on the left and still crossed the Bridge that calls Bridge Santa Trinita, you cover via Tornabuoni straight until to the end, then turns to right for Via degli Agli, straight you across via de Vecchietti, arrived Via de Pecori until to the end, to right for Via Rome, the first to the left on via Tosinghi then turn left on via Calzaiuoli. The Hotel is further on the left. From The Station: to carry itself at the entrance of Hotel Baglioni (DO NOT CONTINUE FOR VIA PANZANI, IS LANE RESERVED TO BUSSES AND IT IS FORBIDDEN!! ), you take the right road Via of the Melarancio between Baglioni Hotel and Majestic Hotel, drive until to Madonna Public square of the Aldobrandini, you take to right for via dei Conti, to the crossroad on the left for via Zanetti, then to right for via Cerretani, at the first traffic-light turns on the left (to right have Laurus Hotel) for via Vecchietti, after the first road on the left, Via de Pecori until to the end, to right for Via Rome, the first to the left on via Tosinghi then turn left on via Calzaiuoli. The Hotel is further on the left.